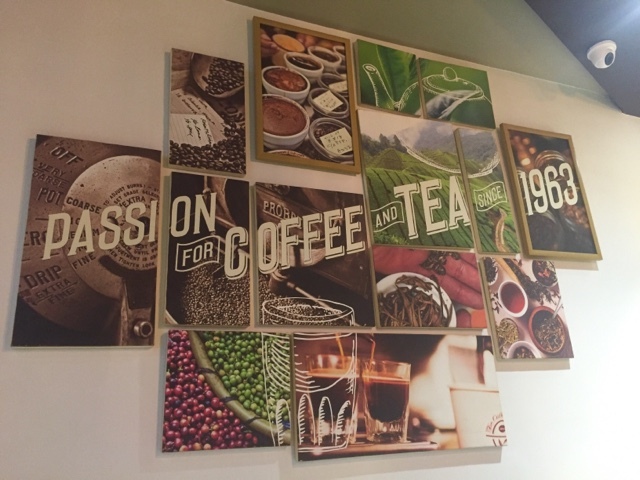 Recently I was invited to a tea tasting session at the "The Coffee Bean and Tea Leaf” in the D.L.F. Mall of India, Noida. A little information first about this chain .The "The Coffee Bean and Tea Leaf” is an American coffee chain founded in 1963 .It is famous for introducing original Ice Blended coffee and tea drinks .It also sells a variety of whole bean coffees, whole leaf teas, flavored powders, and baked goods. 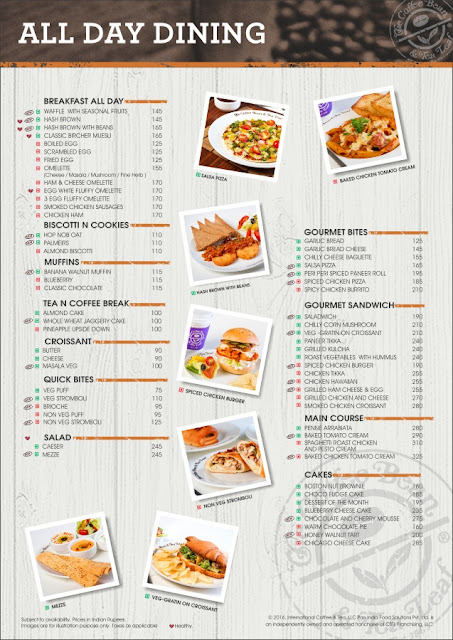 You can also get these products online or at their outlets. 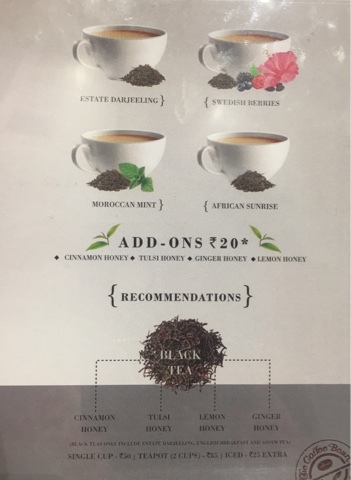 Like any self-respecting Indian , I too love my morning cuppa with equal love for tea and coffee but when you are confronted with so many types and flavors of tea and coffee - it boggles your mind as well as makes you feel like a child in a candy shop . I tasted the Estate Darjeeling tea, The African Sunrise tea, The Earl Grey Tea, The Tropical Passion Tea and the Lemon Chamomile tea. The Estate Darjeeling - I had all my teas without milk and sugar and felt this one to be a strong brew bordering on bitter .I had the black Darjeeling Tea and I can't really put a name to the aroma but it left a strong impression on my palate .It was not as good as some of the Darjeeling tea I have had but came quite close to it. The African Sunrise tea - South Africa has Red Rooibos tea as its specialty and this purely herbal drink is served as a welcome drink in many South African homes .This African Surprise is inspired by the same tea and it is sweet smelling and has a powerful but pleasant taste and flavor. 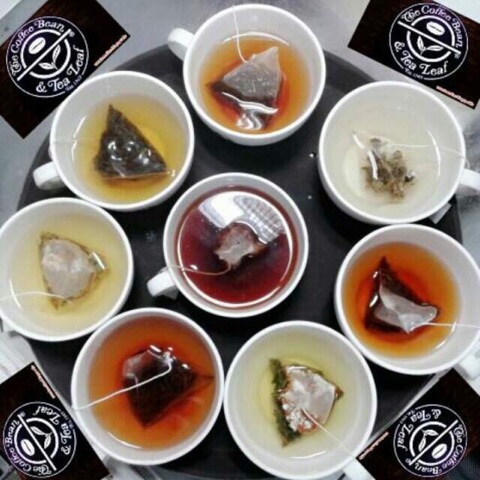 The Earl Grey Tea - The Earl grey is a popular choice of tea in the west especially the U.K. The Earl Charles Grey of Britain saved a Chinese boy from drowning and received this recipe of scenting and flavoring black tea with bergamot oil tea as a token of gratitude from the Chinese , hence the name Earl Grey .So essentially this is black tea flavored with Bergamot essential Oil ( an oil derived from the rind of the Bergamot Orange fruit ). I liked this one for its bright, popping taste and flavor .It has been a favorite with me especially with Orange marmalade on Toasts! The Tropical Passion - This was a very interesting tasting .This infusion had a rich, sweet, divine, tropical, berry like fragrance. In fact, I was drunk on the fragrance itself! It tastes sweet even without adding any sugar and I think can be a hot crowd puller. Lemon Chamomile tea - This is a herbal infusion of Black Tea leaves, Lemon and Chamomile .This was the most wonderful infusion that I had that evening .I could see (in the pouch ),smell and taste the chamomile flowers with every sip and it left me mildly invigorated too .I could not taste the lemon as much but despite that , I could come back again and again at "The Coffee Bean and Tea Leaf " for this infusion itself. What could be better than an uplifting cup of Lemon and Chamomile tea after a hectic shopping marathon! 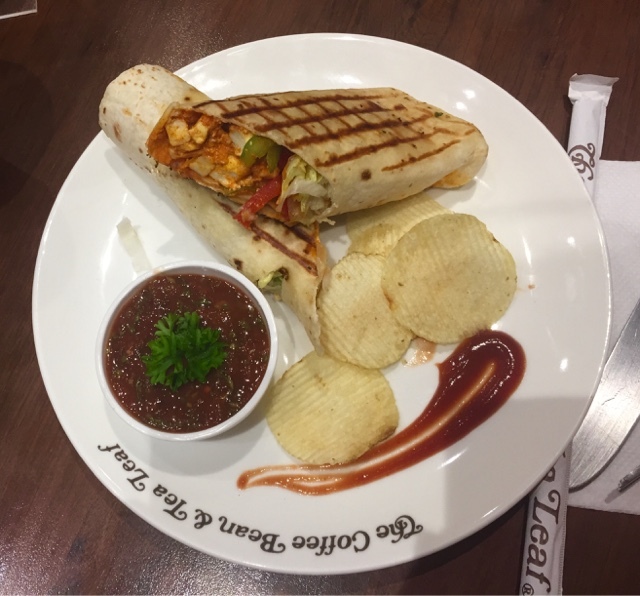 The Food Menu at CBTL is quite exhaustive and varied ! 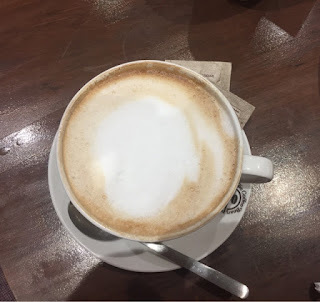 Once the tea tasting session was over, I wanted to try their coffees too as I was told that “The Coffee Bean and Tea Leaf " sources its coffee from six different countries including Ethiopia, Kenya etc. to get the best aroma and taste. I started with a regular cappuccino and it was quite good taste wise and had a good froth head to it though I missed the stenciled designs on top of the coffee ! I was already feeling very full after the tea and coffee session,but tried their Peri Peri Spiced Paneer Roll .The roll was soft and nice and the cottage cheese was fresh and soft too with adequate spicing .I mention soft and fresh because many a times I have had the misfortune of eating stale bread and dry paneer at some famous coffee shops .Despite the fresh ingredients I was disappointed as I could not feel the hot Peri Peri taste at all . .So if you are looking for something hot and spicy , this might disappoint you .The accompanying tomato salsa dip was actually quite good and fresh .I would have finished it if I could ! 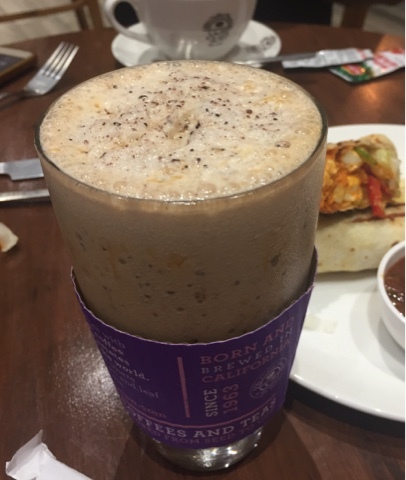 I finished my food journey at "The Coffee Bean and Tea Leaf” with a product that is their USP - “The Ice blended Cappuccino '' .You have to taste it to feel and acknowledge the difference between an “Ice blended coffee” and a "Frappe ". Generally when one orders a "Cold Coffee” or a "Frappe " one can feel chunks of ice and has to crunch on the ice with every sip , to me that is a downer because it dilutes the taste of the coffee and also numbs the taste buds . 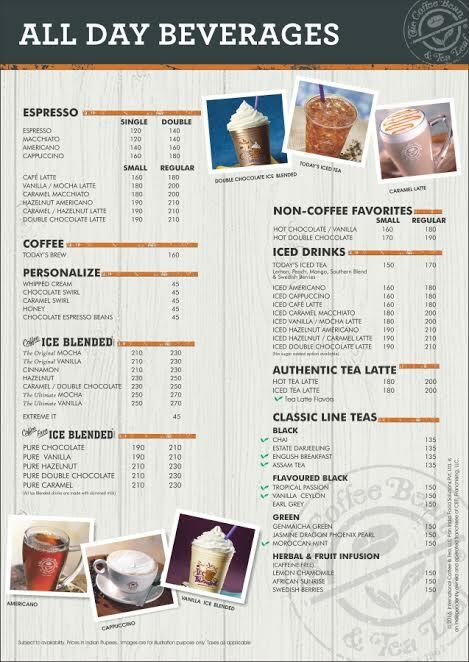 With a Real "Ice blended Cappuccino " , the ice touches your tongue and vanishes ! It just augments your coffee experience rather than hampering it .I had their Ice Blended Cinnamon Flavoured Cappuccino and it was very very good .The cinnamon was very perceptible and added a depth to my cool coffee .Let me confess that I had a cold that day but the Ice Blended Cinnamon Flavoured Cappuccino was so good that I could not resist emptying my jar ! FINAL VERDICT - I was quite happy with this tasting session as I got to discover quite a few fine blends and flavours .I also was impressed with the quality of Tea and coffee brews on offer .You should definitely try out their ''Ice Blended Flavoured Cappuccinos " and their " Tropical Passion " tea flavour . 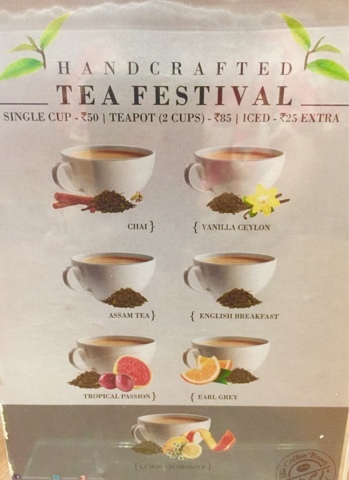 I myself would love to come back definitely for the immensely good "Lemon Chamomile Tea " among other favourites . I rate it a 4.5/5 . 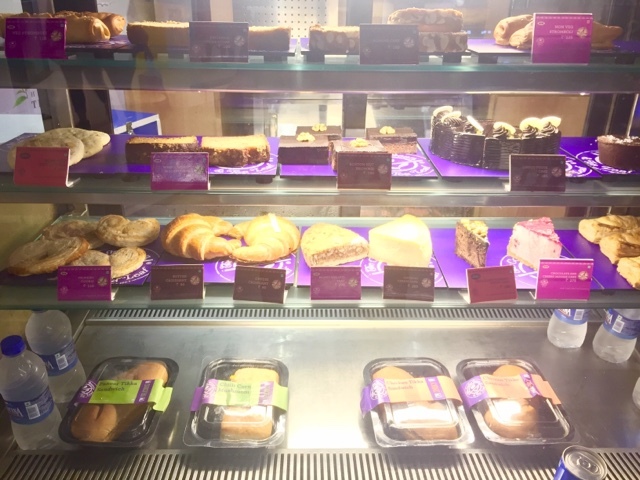 Its a great post The Coffee Bean and Tea Leaf .I think Leaf Tea have much more benefits then coffee. 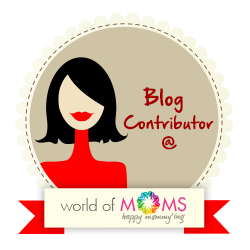 I agree,Ashton!Especially the green tea leaves.Thanks for visiting my blog . The matchasensation service was amazing. Everyone was friendly and great with recommendations!!! It is true that Matcha green tea has caffeine just as coffee does, but it has other ingredients (such as L-Theanine) that help to balance the effects of that chemical and prevent it from causing nervousness.